Heat oven to 350°F. Grease 13x9-inch pan. In large bowl, combine brownie mix and butter; mix at low speed for 45 to 60 seconds or until crumbly. Reserve 1 cup of the mixture in small bowl for topping. Add milk and eggs to remaining brownie mixture; mix until smooth. Spread batter evenly in greased pan. In food processor bowl with metal blade or in medium bowl, combine cream cheese, marshmallow creme and coffee powder; process until smooth. Spread evenly over brownie mixture. 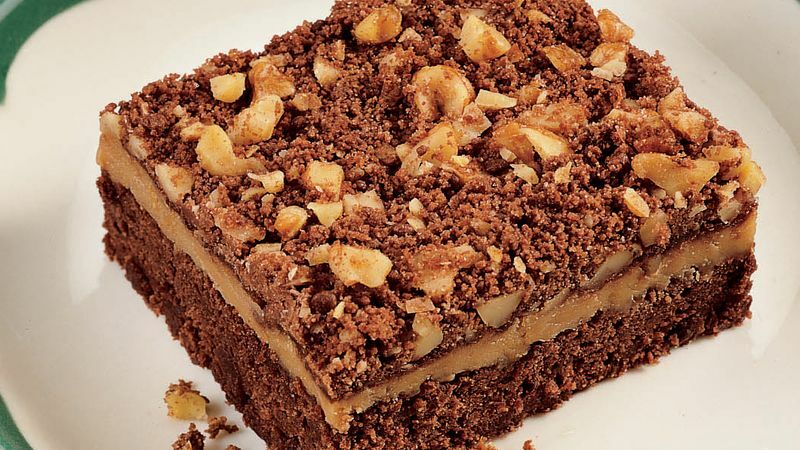 Add walnuts to reserved 1 cup brownie mixture; mix well. Sprinkle evenly over cream cheese mixture. Bake at 350°F. for 40 to 45 minutes or until edges are firm to the touch. Cool 1 1/2 hours or until completely cooled. Cut into bars. Store in refrigerator.